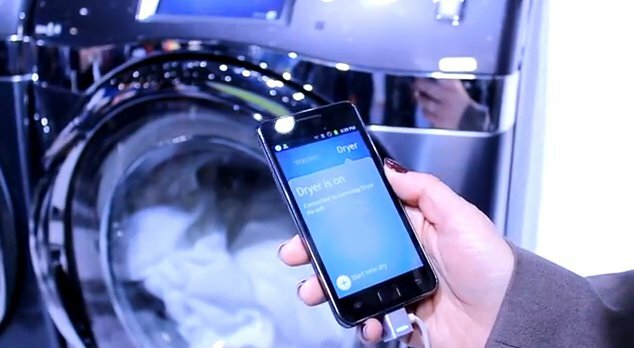 Samsung announced a new smartphone app here at CES 2012 which will help you handle your laundry by communicating wirelessly to a Wi-Fi-enabled washing machine and dryer. I got a closer look, and am still hugely impressed. At first, the idea seemed a little hoaky, but then I looked back on how many times I've forgotten that I had put anything in the wash, and how much a tailored mobile notification system would help out. Here's how it works: the washer and dryer each have their own I.P. address, which your phone can tunnel to no matter where you are. Using the app, you can remotely start up any cycle, which then gives you a timer on how long until it's done. You can also remotely pause a cycle if need be, and use a variety of notification types to let you know when it's done. While I'm sure I wouldn't go out of my way to ditch a perfectly good washer and dryer just for the luxury of getting a ping on my cell phone when a load is done, if I was in the market for a new set anyway (maybe for a bigger house where a buzzer alone wouldn't be enough to get my attention), a feature like this would be a deciding factor. Right now the only other company that's even remotely in a position to offer an alternative is LG. The washer (WS457) and dryer (DV457) will be coming out this spring, and best of all, Samsung says the app won't be limited to their own smartphones, or even to only Android. Stick around for more CES 2012 coverage!